Emeralds and diamonds gold ring set in 14kt gold with circa 1ct of marquise cut emeralds and 0.70ct circa of round cut diamonds of good colour and no visible inclusions. 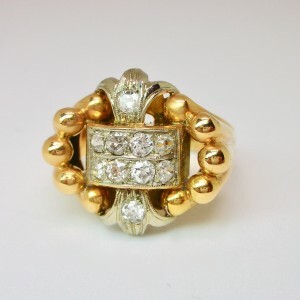 Ring from the 1960s period circa. Stunning 1950's cocktail ring set in 18kt rose gold with central citrine quartz of 15 carats circa. Cocktail ring from the 1930s circa, set in platinum with an emerald cut blue topaz of circa 12 carats, surrounded by small old mine cut diamonds. 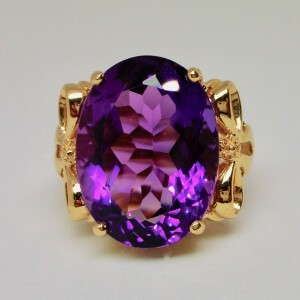 Unsual cocktail ring from the 1960s set in 14KT gold with bow designs on the side, centering with an intense oval cut natural amethyst of 20 carats circa. Gold band ring set in 18kt gold with an emerald cut sapphire in the centre and flanked by two emerald cut diamonds totalling 0.30ct, from the 1970s circa. Vintage ring set in 18KT white gold, with round cut diamonds of a good commercial white for circa 0.50ct total and a natural emerald of good intense colour of probable columbian provenance of circa 1.5 carats. Delicate ring from the beginning of the 1900's set in white gold with a central small natural ruby, surrounded by coronè rose cut diamonds. 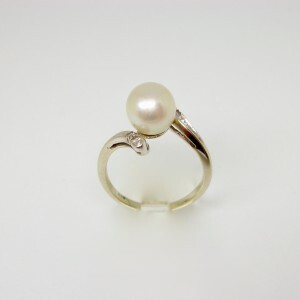 1960s ring set in 18kt white gold with a cultured japanese pearl of 8mm in diameter and small round cut diamonds. Finely hand made cocktail ring set in 14 carat gold depicting floral design and foliage with a pave' composed of round cut natural sapphires and diamonds. From the 1960s period. Ring with delicate platinum setting, featuring an emerald cut natural sapphire of 1.30 carats c.a., surrounded by diamonds for a total of 0.60ct. circa. Ring in 18ct gold from the 1980s, with an acquamarine of good colour, cuscion cut of circa 2.5ct, with six small round cut diamonds. Ring in 18ct white gold with natural sapphire of circa 2.60ct surrounded by old cut diamonds for circa 1ct in total. Ring of probable Italian manufacture from the 1970s circa. 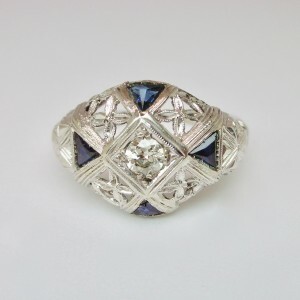 Ring from the late 1930's circa, set in white gold, with triangle cut sapphires and central old cut diamond of circa 0.20 ct.
Ring set in 18KT gold with pavè of diamonds and typical design of the 1950's. 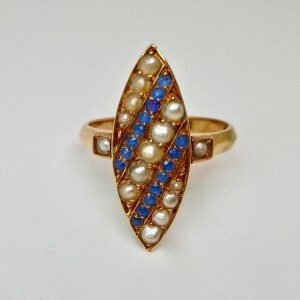 Marquise ring set in 12KT rose gold with natural pearls and sapphires, probably from the end of the 19th Century. Platinum set cocktail ring with 1.50 ct (circa) of diamonds. Typical design from the 1940's.